A different twist to regular medhu vada.. very crispy..
Love this chicken vada recipe....I think I get a superb idea to deal with my leftover chicken!Happy weekend! Thanks Sutapa.. I am glad you are trying it out. This combo will sure be delicious...once has chicken curry and vada in Andra,will try adding chicken next time. Yes, In South India many people serve idlis and vadas with non veg curries too. Really tasty. Try it out when you can. I had this at a restaurant many years back and just loved it. Brought back memories of the wonderful wada. Thanks for the recipe. 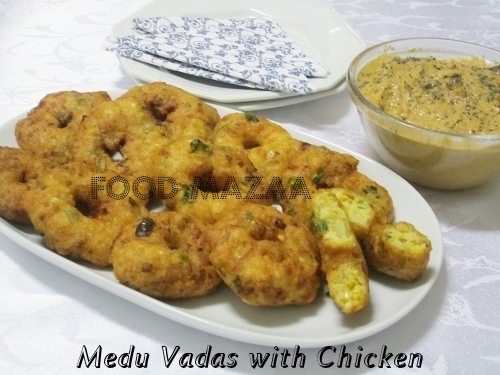 Lovely twist to vadas,yummy & crisp..nice chicken version!! Seriously cant take my eyes from ur irresistible click,super tempting vadas. Wow, thats a great idea, i will have to try this! Thanks .. you will really like them.